You will surely enjoy your time in this trailer at your lake spot, ranch or even your hunting lease. You will have dual slide outs in the kitchen and living area giving you plenty of space to walk around, have a few guests over, and just relax after having fun or working outdoors. The kitchen island adds extra counter space for prepping meals and cleaning up afterwards. The extra room in the middle of this unit has a cube sofa, a flip-up bunk, a walk-in closet, and a slide out plus a place to hook up a TV. This room can be utilized as an office, living area and a bunkhouse. Your master bedroom is spacious thanks to the queen bed slide, and you will find plenty of storage. 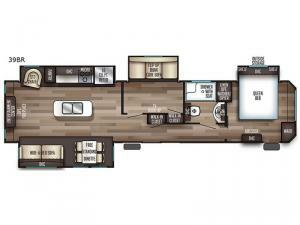 In any Cherokee Destination Trailers by Forest River you will be pleased to find all the comforts you're accustomed to at home. Leave nothing behind with multiple storage options throughout, plus each model includes one to four slide outs, so you will have plenty of floor space to move around. There are three optional packages to choose from to customize your unit just like want. Head out to your favorite destination to your own Cherokee Destination Trailers model today!